While serving with the U.S. Marine Corps in Iraq, Tim was injured by an IED explosion in May 2006. After recovery and rehab abroad and back in the states, Tim learned about Helping Hands through our collaboration with the Injured Marine Semper Fi Fund. 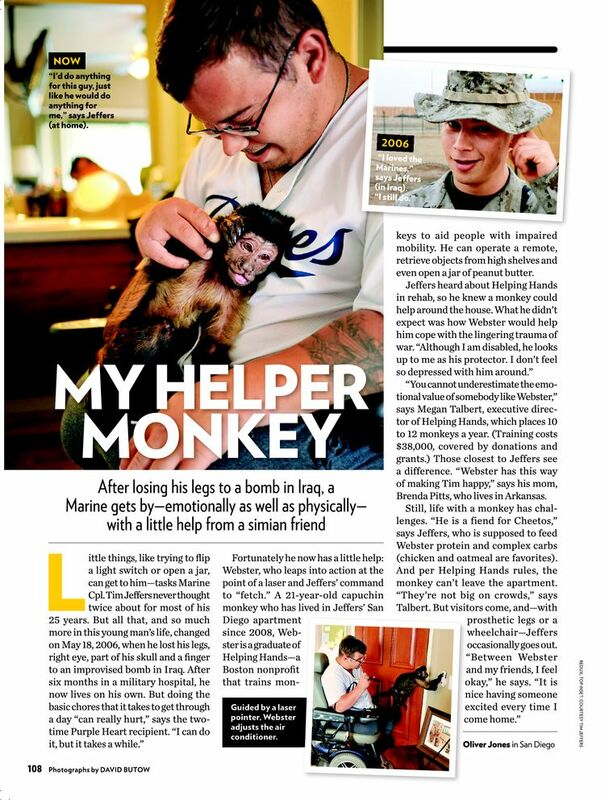 He applied for our program and received Webster, his Helping Hands service monkey. Their story was featured in a February 2010 issue of People Magazine. Tim says his relationship with Webster is special. Although I am injured, he looks up to me as his protector,” says Tim. “I don’t feel so depressed with him around. It is nice that someone is excited every time I come home. I would do anything for this little guy, just like he would do anything for me. To make more stories like Tim's possible, consider making a donation today. See more from Tim and Webster in Imagine a Monkey.